Gruels are type of foods made out of cereals like finger millets (ragi), wheat, sorghum (jowar), oats, corn, and barley. These foods are made ready to eat with milk, curd, or water for breakfast or snack time. They are famous for toddlers as they are easy to digest and are healthy too. Oats Banana Mix- Oats can be powdered and mixed with banana in a blender. This can be added with hot milk to achieve a good consistency. Ragi Malt- Finger millet (ragi) with many other grains can be powdered and stored as a ready-to-eat mix. Ragi malt powder can be consumed with milk and sugar or curd, salt and pepper or curd, or just plain salt. Water can also be added with salt/sugar. Oats Barley Gruel- Oats and barley can be roasted and powdered. Mango juice, milk, curd, or strawberry milk shake can be added to it and consumed. Soya Wheat Flax Seed Gruel- Soya, flax seeds, and wheat should be roasted and powdered. Olive oil, salt, pepper/chilli powder can be added with water. Bring this mixture to a semi-solid consistency. All the above gruel recipes are rich in carbohydrate and proteins. 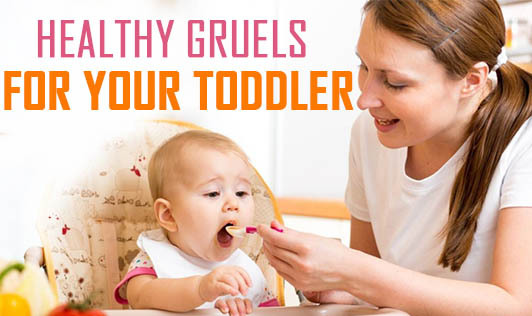 To make it more nutritious vegetable water/dal/any powdered grains can be added according to your toddler's preference.